Black limes are small in size, averaging 2-4 centimeters in diameter, and are round to oval in shape with a hollow, lightweight feel. The rind ranges in color from tan to dark brown, sometimes appearing almost black, and is hard, thick, and leathery with mottling and faint striping. The flesh is dried, dark brown-black, brittle, and flaky with patches of sticky pith. Black limes have a pungent fragrance when opened, offering a sweet-tart, tangy citrus flavor with fermented, musky undertones. Black limes are available year-round. 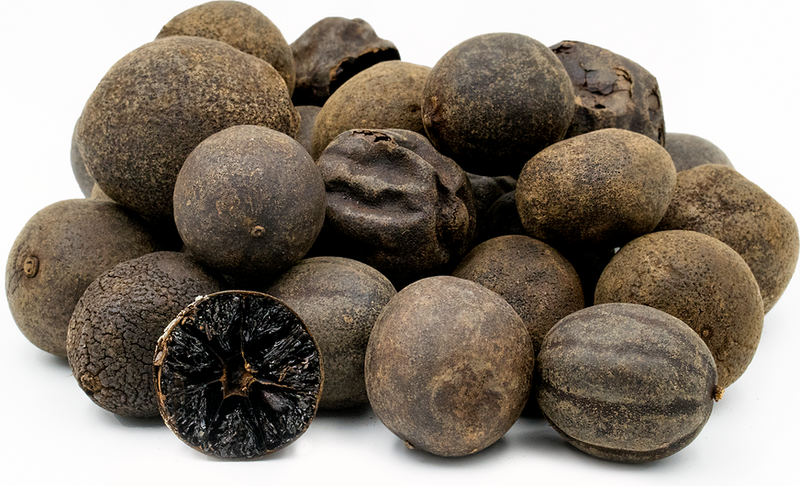 Black limes, botanically classified as Citrus aurantifolia, are dried versions of the Mexican or Key lime and are members of the Rutaceae or citrus family. Also known as Loomi in the Middle East and Dried lime, Black limes are made by blanching the fruit in salt water and then drying in the sun, drying in an oven, or drying in a dehydrator. Most often utilized in the cuisines of Iran, Iraq, and northern India, Black limes are used whole and in ground form to add a musky, tangy flavor to savory culinary dishes. Black limes may contain traces of vitamin C and potassium, but the dehydrated citrus is devoid of much of the nutritional content of fresh lime. Trace amounts of calcium and iron can also be found in the dried fruit. Black limes are used to impart a citrusy, smoky flavor with a slight tang to soups, meat dishes, rice, and stews. The limes can be used whole by piercing several times with a knife or fork and cooked in liquids for rice, in soups, stews, or tagines. They can also be used in ground form and rubbed on meats, sprinkled on beans, mixed into grain bowls, or used as a substitute for sumac. Black limes pair well with meats such as poultry, lamb, fish, steak, and pork, okra, carrots, peas, fava beans, corn, tomatoes, wild rice, quinoa, basmati rice, lentils, dill, parsley, ginger, fennel, turmeric, garlic, saffron, and pistachios. The limes should be stored in an airtight container void of humidity for up to three months. Black limes have been a mainstay of Persian cuisine since ancient times. Bedouin women used Loomi or Black limes to dye yarn. In Saudi Arabia, Black limes are a staple ingredient in dishes such as kabsa, matazeez, jareesh, and qursan and are also used to make Loomi tea. Today Black limes have seen a resurgence in popularity through the cocktail industry as well-known bartenders are creating drinks using the ground Black lime. The dried fruit adds a burst of tart mixed with rich, fermented undertones to create unusual flavor pairings and the taste blends well with darker, aged spirits such as brandies and rums or fruit forward drinks such as punches and daiquiris. Limes are native to Asia in an area described as the Indo-Malayan region, which stretches from India to Southeastern Asia, including the Philippines, Malaysia, and Indonesia, and have been growing since ancient times. The fruits were then believed to have been brought to North Africa and the Eastern Mediterranean region by Arabian traders in the 10th century. The process of creating Black limes was originally developed in Oman, which is a country located south of Iran along the Arabian Sea, and today the limes can be found in Persian food stores and specialty grocers in Asia, Europe, and North America. Recipes that include Black Limes. One is easiest, three is harder.